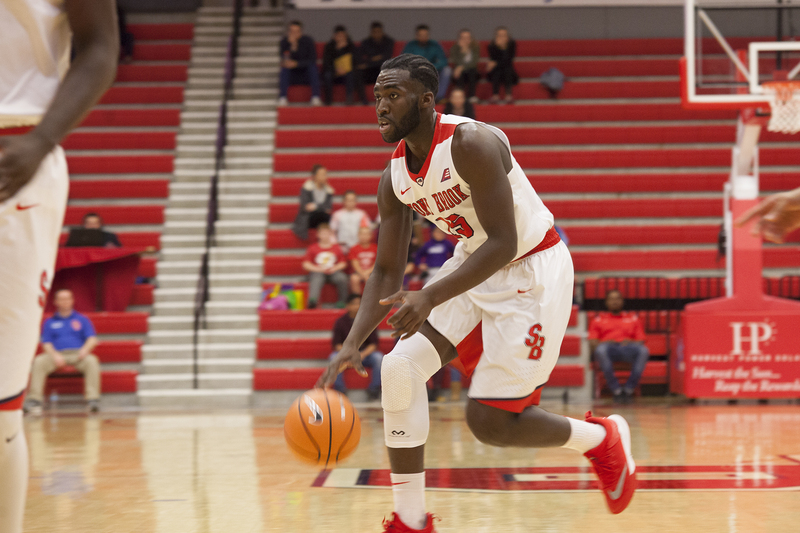 Despite trailing 22-0 in the first half and committing an accidental technical foul in the closing seconds of the game, Stony Brook Men’s Basketball fought back and won 77-74 in overtime over George Washington University in the season opener on Tuesday, Nov. 7. The Seawolves had a stagnant and unlucky start, going 0-18 from the field with four turnovers in the first 10 minutes. Despite early fumbles, the team found its rhythm and finished the half on a 24-12 run and down by 10. The Seawolves continued to cut the lead after halftime, leading to a hectic ending of regulation where the team was able to capitalize on the Colonials’ missed opportunities. The Colonials missed game-clinching free throws in the final 30 seconds and couldn’t get off a crucial inbound pass, allowing Stony Brook an opportunity to get the ball with 5.9 seconds left. Junior forward Akwasi Yeboah was able to jump past defenders and force overtime off a tip-in shot. Energized in overtime, the Seawolves outscored the Colonials 14-11. Stony Brook took the lead for the first time when sophomore guard Andrew Garcia drained his second three of the game. George Washington could not keep up with Stony Brook’s scoring outburst and went 3-12 from the line when it mattered most. Some of the key contributors in the season opener besides Yeboah and Garcia were sophomore forward Elijah Olaniyi and freshman guard Miles Latimer. Olaniyi not only made both of his free throws with five seconds left in regulation, but he recorded a career-high 18 points and also brought down 10 rebounds, giving him a double double. Latimer scored 15 points in his collegiate debut along with two three-pointers and two steals. Boals was thrilled in his team’s resilient ability to come back. He was also confident that the team can keep up the momentum going forward. “I could not be more proud of our guys. We were down 22-0 and just kept chipping away and battling back. We found a way to win and that is what championship teams do,” Boals said. This marks the first time that the team has begun a season at a winning 1-0 record since 2015-16. The Seawolves will continue their road journey to South Carolina as they look forward to their matchup against the Gamecocks on Friday, Nov 9. at 7 p.m.